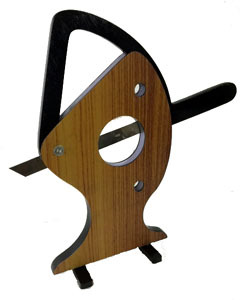 The Disecto is similar to the Arm Chopper effect, in a different design frame with a pivoted blade. The blade swivels out of the frame, allowing the audience to see it is a solid blade. When pushed down, blade slices through vegetables in smaller holes on top and bottom, but leaves hand in larger center hole unharmed. Made in laminated wood and metal.